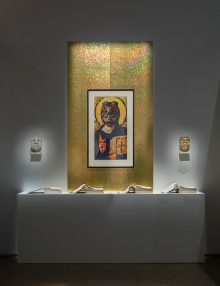 Dear Listener: Works by Nicholas Galanin is a mid-career retrospective of contemporary Native Alaskan artist, Nicholas Galanin. Galanin, b. 1979 in Sitka, Alaska, is of mixed Tlingit-Unangax and non-Native ancestry. His approach to making art is conceptual, thematically addressing pertinent issues of American Indian representation and cultural critique. Galanin takes a multidisciplinary approach to art-making; his body of work includes sculpture, installation, video, performance, and new media. His conceptual work is often provocative and addresses issues of authority, authenticity, American Indian experience, and the commoditization of Indigenous culture. 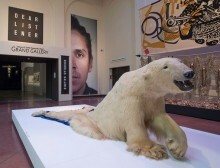 Galanin brings to his work a liberated space for engagement with people of all cultures, and a platform to which they can relate from their unique cultural perspectives. Proclaimed a “standout” by The New York Times, Galanin’s prominence in the contemporary art world only continues to grow. His work has been featured in exhibitions at The Native American Pavilion at the Venice Biennale, Anchorage Museum, Nevada Art Museum, National Museum of the American Indian, IAIA Museum of Contemporary Native Art, Peabody Essex Museum, Portland Art Museum, Museum of Art and Design in New York, and is in private collections as well as in the permanent collections of the National Gallery of Canada, Portland Art Museum, and Denver Art Museum to name a few. Galanin’s work has been reviewed by publications such as The New York Times, Art in America, Hyperallergic, and The Queens Chronicle. 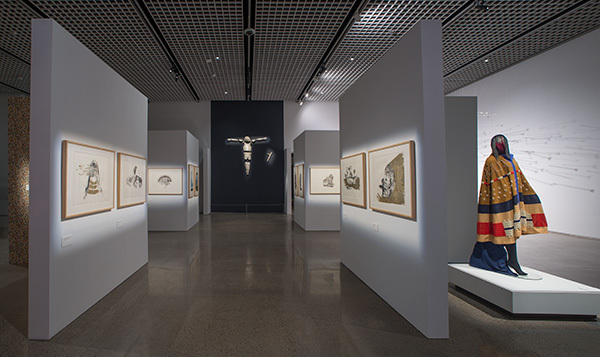 The exhibition explores themes of Indigeneity, the porosity of identity in both Indigenous and American contexts, and reciprocal dialogues therein. Works inspect the notions of landscape, colonialism, and redress the rampant misappropriation of American Indian aesthetics and visual culture by non-Native individuals, and highlight the artist’s nimbleness in the reclamation of Indigenous agency. The title of the exhibition, Dear Listener, is an intentional direct address to the viewer – playing off of clandestine broadcasters addressing their listeners in the same manner, it is an active attempt at creating a discursive conversation between viewer and artist, and metaphysically to the theoretical concepts contained within the works. The works are visually powerful, imbricated, and arresting. From Galanin’s 2017 single channel video Unceremonial Dance Mask as a commentary on mass-produced “Native looking” objects from Indonesia, to Indian Children’s Bracelet, which is a pair of handcuffs used during the residential school period to remove American Indian children from their homes. The exhibition is installed in the Virginia G. Piper Charitable Trust Grand Gallery, the Dennis Lyon Family Crossroads Gallery, Freeman Gallery, and the historic South Courtyard. 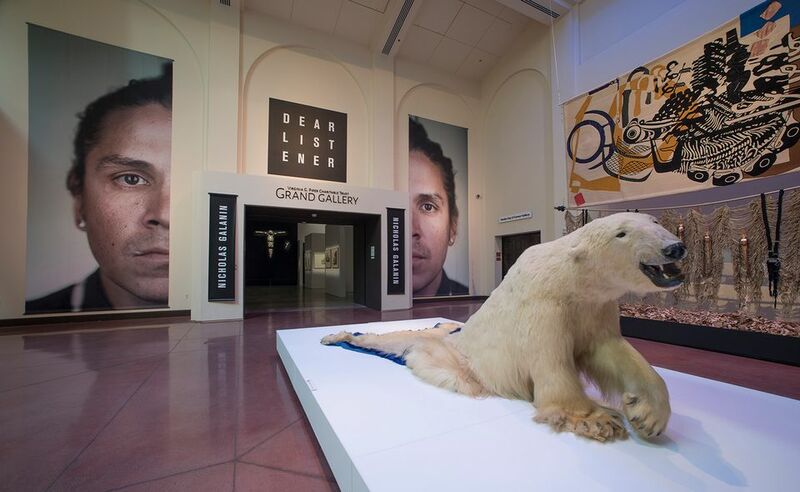 Dear Listener, curated by Heard Museums’ Fine Arts Curator, Erin Joyce, features more than 10,000 square feet of new and existing works by Galanin including video installation, sculpture, performance art, works on paper, installation work, and fashion. View of Dear Listener entry. 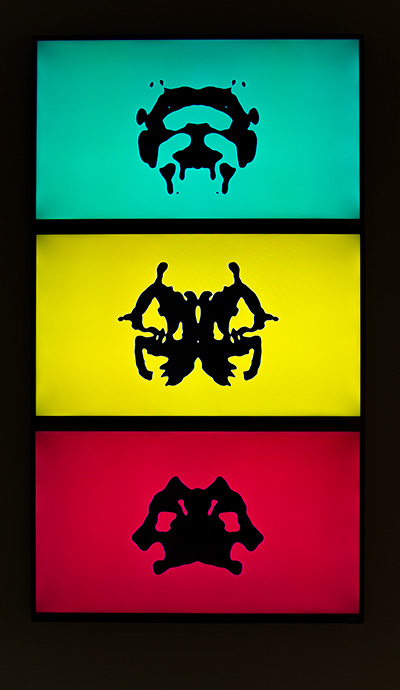 Nicholas Galanin, "Ism No. 1" 2013. Installation. Nicholas Galanin, "Where Did it Go?" 2014. Video installation with Christian Petersen. 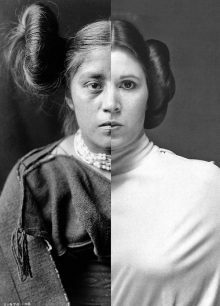 Nicholas Galanin, "Things are looking Native, Natives looking Whiter" 2012.